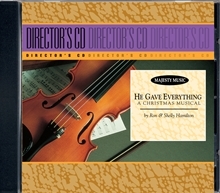 This powerful collection of original Christmas songs by Ron Hamilton blends with stunning arrangements of traditional carols by Shelly Hamilton. There are 11 songs in all, complementing a Christmas drama that tells a story of a modern-day family who helps a poor family with desperate needs. Both the story and the music remind us that Christ sacrificed everything to redeem us. Now, we are also called to sacrifice everything to bring others to Him.